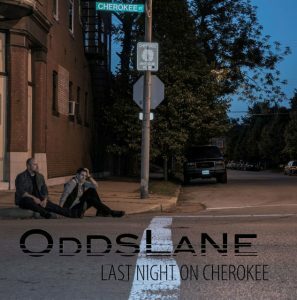 The St. Louis, Missouri based duo, Odds Lane, has been performing for over two decades. 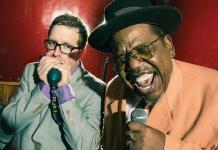 Their second CD release, Last Night on Cherokee, is taking them back to their funky, greasy, South City roots, as well as bringing them full circle in their career, thus far. We recently got to talk to members Doug Byrkit and Brian Zielie about their music, their careers, both on stage and in the classroom, their connections with the South side of “The Lou,” and their common infatuation with Stephen King. While both are songwriters, Byrkit is the lead vocalist and plays bass and guitar, while Zielie plays drums and supplies backup vocals. Both studied music in college and are currently teachers. They spent years recording and touring with various artists, including former band mate, Mike Zito, and their 2012 release, Dark Matters, was an award winner, garnering them multiple television network licensing deals. Last Night on Cherokee, was inspired by Zito, who convinced the guys to, “delve deeper into their South St. Louis funk/blues roots.” The songwriting began, the album emerged, and the rest…well, we’ll let them tell you the rest. JD Nash for American Blues Scene: Odds Lane. Where does the name come from? At our age, we’ve been through a lot of bands, with a lot of names. So, finding names is always not a fun part of the job. We ran out of fresh stuff a long time ago. But, we’re both big fans of Stephen King’s book series, The Dark Tower. Our prior iteration of this band was called, The Breakers, which was based on something from his book. When it came time to come up with a name for this band, we basically went through the encyclopedia of that book series until we found a phrase from the book that sounded cool. Odds Lane was the name of a street in the seventh book of the Dark Tower series. For over twenty years we’ve been trying to pick band names, and when we came up with The Breakers, we thought, ‘Yeah, we found it! We’re both Stephen King fans, and its not a musical thing but still it sounds cool.’ When we found that name, it was like the beginning of the internet, and there was another band, in Denmark, that had the same name. A few years went by and we ended up getting an email from ‘Little Steven’ Van Zandt‘s record company, Wicked Cool Records, who had signed the Denmark Breakers to their label. He comes calling, saying, ‘Hey, I want to buy your name,’ and we said, ‘ok.’ We had spent so much time picking that name, that we really liked due to the history, and the book series, and we’re musicians, but we’re also nerdy, odd balls at the same time. Then Brian finally found Odds Lane, and I agreed to it. Ok, I have to ask. When Van Zandt contacted you, did he do it as a record label owner, or his Sopranos character? You guys recorded at Sun Records once? Yeah, not this record, but back in 2005. They actually called us. It was through the Memphis Grammy chapter, and Sun was doing a thing to help up and coming bands. They invited us down to record, put us up in a hotel, and it was this whole crazy weekend. What about your first album, Dark Matters in 2012? That was recorded in kind of a hodgepodge of places, mostly at one of the colleges I teach at in Godfrey, Illinois. Listening to Last Night on Cherokee, some of the lyrics seem a little dark. Is that, again, Stephen King coming out? Our collective sense of humor is dark. We’re not just brooding around all the time, but things we find funny, things we find interesting. I mean, we’re not dressing up as vampires or anything. Its not a goth band. But everybody has demons to deal with. It may be my back hurts, or I can’t pay the mortgage. But our way sounds a little more ‘artsy.’ And it gives us a way to deal with old roots rock and blues themes that we like. Now, where does the title, Last Night on Cherokee come from? Its one of the lines in the song, ‘Take It Slow,’ which is the third track on the album. But the whole idea of the album, that song, and that lyric, kind of sums up what we were doing with this record in general. We’re re-discovering stuff we had an interest in a long time ago. We kind of strayed away from it, but somehow found our way back. It has a lot to do with the music we were doing when we lived in South City. Cherokee is a South St. Louis street, kind of known for being the steamier side of South City. We were in a band, years ago, with Mike Zito, and we all lived in a house together down there. 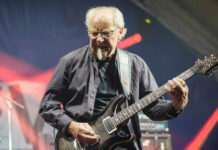 We kind of lost touch with Mike for a while, then we got back in touch with him, did a couple reunion shows, and got back into that style we were playing back then. Stuff from the Blue Room album, and that kind of stuff. The title suggests that we’ve come full circle back to that time, that area and those themes. I think its a subconscious double entendre. Last night meaning, literally things that happened last night. Or like, the final night and our return to it. In the songwriting department, do you do that together? Its a collaborative process. The process is usually me coming up with some kind of lyric or melody. I send it over to Brian, who makes some changes, and then we just go back and forth until its something we agree on. This time though, it was a bit different. We’d come up with a basic riff, and then we’d jam on it for twenty minutes to see what would happen. We recorded the jam and then would play it back, making changes until it was right. Doing the recording, we wanted it to have a live feel. But in the writing process, we wanted to spend as much time as we could on everything before we went into the studio. So Doug, on this album you play both guitar and bass? Yeah. Again, kind of different. On the last album we had a few more people filling in the gaps. But this record, its just us. I mean, the band is just us two anyway. When we play live, we’ll hire a bass player. One thing we’ve always been known for is playing drums and bass really well together. This time, I decided, for this record, to do both. I pretty much just play the drums, and do some background vocals, but I’m not as multi-talented as Doug. I mean, unlike Doug, I’m only terrible at one instrument. He’s awful at several. That would be a more accurate representation. You’re signed with Bongo Boy Records. That’s kind of different for them. They’re known more for compilation albums, right? They do a lot of compilation stuff, but one of the heads of the label, Gar, is an old blues guy. Well, he’s actually an old punk rocker from the CBGB days, but he’s really into roots and blues. I mean, if you listen to his guitar playing, he’s a blues player. They don’t always get that kind of stuff to put out, so they really took a shine to us. It really makes us a big fish in a small pond. Knowing what we now know about the new release, is it a story album? No. Its not a really a concept album, in that way. All of the songs kind of relate, in a fashion. They don’t necessarily all relate lyrically, but musically speaking, they all relate to that time period. You’d really have to know us and know Blue Room, inside and out, to really catch everything. But there’s a connection all the way through. Its not a book, but its more of a vibe or feeling. This is your sophomore release as Odds Lane? We’ve recorded other albums with other bands, but as Odds Lane, yes. This is our sophomore project, and I think, our best. Not just because its the newest. We’ve already begun writing songs for another album, but this one sounds like us. I think we’ve found the right balance between all of our really eclectic musical interests. I think this is probably what ‘we’ sound like, and that’s something we’ve been looking for, for a long time. You can’t pigeon hole us. One of the biggest compliments, and one of the biggest complaints we get from other people, is ‘You guys just don’t really sound like anybody else.’ Trying to sell, that can be a big issue, but we also take it as a really big compliment. It just occurred to me. This record in particular, the conscious decision to ‘get back to our roots,’ because of our reconnect with Mike, and other factors, is the first record where we’ve stopped trying to avoid those things. Instead of a conscious effort to do something, we stopped trying to sound like something. Naturally, this is what happened. We stopped trying to say, ‘well, this is too bluesy, or that’s gonna be too funky.’ This time we decided to just play. And in that we realized, oh yeah, this is who we are. Are you touring the album now? We are playing some localized Midwest shows, but the label is working on booking a bunch of East Coast gigs and once we’re out there, we’ll pick up other shows. What should people know about Odds Lane? If I had to sum it up: People should know that we’re honest musicians, and honestly, that’s what we do. Our music is our personality. Like the old jazz players. Sometimes the personality was almost more important than the music. If you listen to our record, you’ll know something about us. The music that we make, that’s honest. That’s us. That’s what we do.